After long discussions, Thorbjørn Jagland has been elected Secretary General of the Council of Europe. The dispute over the election of the Secretary General of the Council of Europe has been going on for a while, as I have covered in the past (here, here, and here). Today, the Parliamentary Assembly of the Council of Europe, a mainly consultative assembly of the international organisation, in which delegates from all 47 parliaments of the Council of Europe member states meet four times a year, has finally elected the former prime minister, foreign minister, and president of the Norwegian parliament, Thorbjørn Jagland (new photo) with 165 against 80 votes for Włodzimierz Cimoszewicz a former Polish prime minister (see the press release). The election is not a too big surprise, but I still think that the election of a Norwegian for this post is a particularly good choice. Since the main task of the Secretary General is to moderate between the 47 member states, including the 27 EU members and most other countries of the continent, including Russia and Georgia, Turkey, Armenia and Azerbaijan, it is good that the SG is neither from an EU country nor from a country involved in conflicts with its neighbours or in serious human rights violations. This is also of advantage for the relations between the Council of Europe and the EU, since the present Special Representative of the CoE to the European Union is former Norwegian ambassador to the Council of Europe Torbjørn Frøysnes - so the two might be able to work together in way that will strengthen the relations between both institutions. Altogether, it was time that the Council of Europe finally got a new leadership - and I am glad that it is a profiled figure such as Mr Jagland who will be responsible for the most important human rights watchdog on the European continent. The German parliamentary elections are over, and although the results are not yet final, the political game will move on quickly. The Grand Coalition of Merkel's Christian Democrats (CDU/CSU) and the Social Democrats (SPD) is over, due to an expected but still painful historic loss of the SPD (23%) with its candidate, foreign minister Frank-Walter Steinmeier. Nevertheless, Angela Merkel will remain the chancellor of Germany, thanks to only small losses of the CDU/CSU (33.8%) and the strongest results of the Liberals (FDP) - lead by Guido Westerwelle - in their history (14.6%), with whom Merkel will form a coalition for the next four years. The Christian Democrats will be even stronger than their overall election result suggests, because the will receive many overhang seats because of their strong results in the constituency votes, a particularity of the German election system. The other two parties in the Bundestag (the German parliament) will be DIE LINKE (the Left Party; 11.9%) and the Greens (10.7%). The Pirate Party received 2% in their first participation in national elections, the extreme-right NPD got 1.5%, both missing the 5% threshold to enter into the parliament but still qualified for the party financing for the next 5 years (85 Euro Cents per vote for the first 4 million votes, 70 Cents for every further vote). How will this effect EU level politics? After these results, it is pretty sure that the next German Commissioner will be Christian Democrat (EPP). Due to the strength of the Liberals in the new coalition, I don't think that it will be Wolfgang Schäuble but rather a more moderate candidate like Peter Hinze. In any case, the victory of Merkel will thus also strengthen Barroso. Due to the rather market-liberal shared profiles of Christian Democrats and Liberals, I also expect that Germany's positions in the Council will be more market liberal than before. In the European Council I do not expect major changes since Merkel will continue to be a dominant figure profiting from her already existing networks to other European and international leaders. Despite the previous argumentation, there is also a possibility that the German behaviour on the EU level will be characterised by internal veto points. Different to the last four years where due to the Grand Coalition the opposition was divided and weak, the joint left-wing opposition of SPD, the Left Party, and the Greens will use all the powers it has - including creating veto points in the second legislative chamber, the Bundesrat, where the federal states are represented - to slow down German decision making on the EU level. This is particularly relevant after the recent changes of the participatory rights of the legislature in EU decision making. And although this sounds rather negative, it could also mean that EU politic could become more visible due to more active debates on the position(s) of the German government on the EU level. But this will have to be seen. The new government will most likely see a combination of two leading personalities that are unprecedented in the EU and probably also beyond: A woman (Angela Merkel) will be leading the government and the foreign minister will be a homosexual man (Guido Westerwelle). But more interesting will be that neither the one nor the other have played any role in the campaigns - and it won't play any role in the future government because both is not considered very special in Germany at the end of the first decade of the 21st century. But I think that this will still be a sign for an EU where equal rights - both for women and for sexual minorities - are still not respected all over the place. Altogether, German politics will see continuity in its main leadership, but it will face major changes in the political dynamics with more pro-economic policies, a stronger polarisation between the political camps and probably also an intensive politicisation of the multilevel politics between the national institutions, the federal states, and the EU level. Other Euroblogs on the same topic: Grahnlaw (excellent summary), Europe & You, Stephen Spillane, Jonathan Fryer, Alpha.Sources, Gavin Hewitt, Carl Bildt, Eurozone Watch, Andre Feldhof, Géopolitique, eToile. National elections in EU member states concern the lives of citizens not only in the respective countries but in all countries of the Union. Through the policy-making power of the EU Council and the guiding weight of the European Council, governments influence the European political agenda as well as the outcome of negotiations on the European level, possibly even including the level of the working groups in which administrators and diplomats prepare and discuss future legislation. In Portugal, the latest poll foresee that the Socialists will remain the strongest power, although they won't be able to hold the absolute majority and might be forced into a minority or coalition government. In Germany, Angela Merkel's Christian Democrats (CDU) will very likely win the elections (see the latest opinion polls) while the unwished present coalition partner, the Social Democrats with their candidate foreign minister Frank-Walter Steinmeier, might receive the worst result in the history of the Federal Republic. The question will be whether Merkel's CDU (together with its Bavarian sister party CSU) will have a majority together with Guido Westerwelle's Liberals (FDP) - the polls are very tight - to form a coalition of the economic right led by Merkel or whether Merkel will have to continue with the Social Democrats. The two other parties likely to enter into the Bundestag, the Left Party (DIE LINKE) and the Greens (Bündnis 90/Die Grünen) don't seem to have a power option because all likely (triple) coalitions that include them have either been categorically ruled out by the other three parties or by the two themselves. The most likely result of tomorrow will thus be that Angela Merkel remains the Chancellor of Germany, not matter what the election result. However, a renewed but shrunk Grand Coalition (Christan Democrats and Social Democrats) will be less stable than it was in the previous term, risking not to hold for another four years. A "Tiger Duck Coalition" (term created during this campaign because the two colours of the tiger duck represent the Christian Democrats and the Liberals) in return will mean a shift in policies towards the economic right, but it will also create a stronger opposition of the then concentrated left and centre-left that might slow down German decision making in crucial policy areas, especially through the counter-balance of the second chamber, the Bundesrat, in which the federal states co-legislate and in which the CDU/FDP coalition would only have a tight majority that might change after regional elections in one or another major federal state (two minor federal states - Brandenburg and Schleswig-Holstein - are voting tomorrow, too). Both scenarios would influence the German government's ability to act - in substance or speed - on the European level in the next 2-4 years, not least because of the strengthened position of the legislative branch after the Lisbon Treaty ruling of the Constitutional Court and the subsequent adaptation of the by-laws regulating the involvement of the two legislative chambers, Bundestag and Bundesrat. The only small surprise factor in tomorrow's result might be the Pirate Party, probably the first party movement boosted by European dynamics (especially in Sweden), that could gain a visible part of the (extended) youth vote. The party running mainly on new technology, file sharing, and data protection issues was able to create considerable attention during the early stages of the campaign but wasn't able to keep up the pace of the traditional media (although the overall campaign was extremely boring and low key, not too far away from the European Parliament election campaigning). So I expect that they will reach the 2-3 percent tomorrow, not crossing the electoral threshold of five percent. I myself won't be able to report during the day tomorrow because I'll be working in a polling station, but for anyone who wants to get a glimpse at the debates and who is able to speak German, I recommend following the #btw09 hashtag (short for: "Bundestagswahl 2009") on Twitter. I'll then try to give a summary when I return late in the evening on Sunday, or at least to link the most interesting reports of others. Read also on the topic: A Fistful of Euros. I am trying to catch up after my trip to Hungary. One week with only rough checking of Euroblogs feels like a decade without reading a book. First and notable there is new member in our euroblogging family: BBC's Gavin Hewitt will be the new Brussels correspondent and started promisingly and enthusiastically into his euroblogging career with a reflection on "The capital of Europe" and followed already by three other posts since Tuesday. In the meantime, Open Europe is bashing the Young European Federalists because they support the Irish YES to Lisbon with public money, while my favourite EU lobby watch Brussels Sunshine criticises "MEP-industry fora" as lobbying events without transparent funding. Josh from the EP web editors notices that the European Parliament is not always working very media friendly, while La Com européenne discusses the recent re-launch of the EUROPA.eu portal. Joe Litobarski published the first "Chasing Brussels" podcast in which I will also participate in the future (couldn't be there this time due to time constraints), enriching the EU media scene with more personal voices on EU politics. Behind The Scenes one is waiting for Klaus, while Poland has opened a new (European) chapter in its security policy orientation, summarises Jean Quatremer. Eva takes a look on how the new Commission will look like regarding substance and power, while Grahnlaw voices uncertainty on whether the next Commission will just be a temporary Commission until Lisbon enters into force. On Ideas on Europe, Pietro de Matteis points out that Iran is now using the Euro as main foreign exchange currency while Giorgi Gotev is delighted to report that (thanks to the retreat of Commissioner Ferrero-Waldner) the Bulgarian diplomat Irina Bokova has been elected UNESCO Director General. Oh yes, and don't forget to notice the second round of Think about it! (Twitter hashtag #think2), this time on Climate Change. Many Eurobloggers are participating, inter alia: EU Law, Stephen Spillane, Joe Litobarski, Andre Feldhof, Conor Slowey, Louis Lepioufle (anyone missing?). Cecilia Malmström is also on a long road to Copenhagen, but not on the Think2 train, while Mitja preferred bikes during the European Mobility Week. This all happened while Germany finally ratified the Lisbon Treaty, as is registered by Europe & You (given that Ralf's trust in the German diplomatic service is justified) - and so we are now waiting for voice(s) of the Irish, with my own hopes being on the YES side! 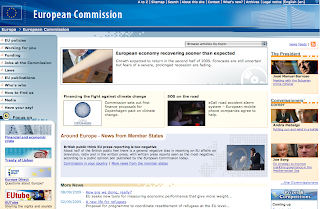 There was much more in euroblogs over the last days, but that's it for now. "Europe in blogs - Euroblogs" will be back soon. PS. : And the Swedish Foreign Minister still embarrasses with his sheer endless stream of blog articles, more than any other individual euroblogger. Sweden and José Manuel Barroso, can you make him EU Commissioner for Communication, please?! Not much blogging this week as you have seen. The reason is simple: I spent some days in Hungary, combining holidays with being a Euroblogger. Upon the invitation by Café PR, a subunit of Café, one of the largest PR and communication agencies in Hungary, I participated in two Media Academies that Café PR organised for the European Commission in Hungary. The goal of this series of academies is to discuss with local and regional journalists on how to report about the EU, how to find reliable information on EU topics, and how to link EU-related information and news with relevance for the local/regional level. After I got asked whether I would be ready to participate as a presenter during two of the academies, sharing my experiences on how I - as a blogger - find and present EU-related information, I adapted my initially different holiday plans in favour of Hungary. So I first spent two days of pure holidays in Budapest - a city that can easily cope with other major European capitals as a touristic destination - and then moved on to Debrecen and Szeged where the Academies took place. Especially Debrecen was the positive surprise of the last years. Being the 2nd-biggest city in Hungary, Debrecen has a beautifully restaurated city centre that is larger than one might expect at the first sight. But the self-proclaimed "Calvinist Rome" impresses not only with its city centre, its nice choice of cafés and bars, and with an open friendly human atmosphere, but also with a university complex that is a touristic attraction in itself. The campus is situated some two kilometers north of the historic city centre, on the southern rim of a large forest-park, and since the tourist information recommended going there and also to pass by the university I finally found myself in front of the main university building - and had difficulties to close my mouth (which wasn't made easier when seeing the interior, too). And it is not just the main building, the whole campus with its mix of historic, modern, and functional buildings, its huge fountain and the botanic garden is more than impressive. Together with the atmosphere in the centre and on the campus, Debrecen left the image of an excellent place with all basic conditions for academic work. They involved, beside myself, one of the main and most respected EU experts in Hungary, Zoltán Horváth, and György Urkuti, editor at the Hungarian business newspaper Világgazdaság and renowned journalist with a major focus on EU affairs, as well as Ákos Moskovits from the Media Unit of the Commission Representation in Hungary. Our presentations went from current EU affairs over how to find interesting EU news and information to good and bad examples on how the EU is presented in Hungarian news, which seemed to be a fairly interesting mixture of perspectives. So it was a pity that not too many journalists were participating in the free events... Nevertheless, I still had the impression that those who were there took an honest interest in what was said, and I had the feeling that even the euroblogger's perspective I was representing was of some added value, in particular to the younger journalists present. For me, this trip was in any case extremely valuable, both because I could discover Hungary and because I met a number of amazing people I might not have met otherwise and with whom I share the passion for Europe, European politics and modern communication. My warmest wishes and thanks thus go to Veronika and Anita from Café PR who did a marvellous job in organising the events and who were maximum helpful and flexible in facilitating both my travel and accommodation. I also send many thanks to my co-presenter György, who, as I learned, is a reader of Euroblogs and proposed me as a possible presenter for these events to Café PR. What I again take with me from these days is that Europe and the EU is not about Brussels and Strasbourg, but it is about people with shared interest meeting and discussing freely, without borders between their countries and without walls within their minds - and anyone who does not understand this dimension of European integration will never understand my passion for the European project! 53% is the magic figure, 382 warm votes for the man running the European Union - a firm YES to the Barrosocracy. "[Y]ou know your obessed with EU politics when your entire twitter stream is telling you the result of the Barroso vote!" José Manuel Barroso has been re-elected, and received the absolute majority of votes of all members of the European Parliament, which had made him the Commission President even under the more rigid rules of Lisbon Treaty that has not yet entered into force. Some are still saying that the 53% make him the weakest president in the history of the Commission, but for once I don't want to blow into this same horn. This 53% is nothing but a clear sign of the politicisation of the European Union and the European Parliament, which makes Barroso the president under the strongest European Parliament ever. This tight vote shows that the election of Barroso was not the most obvious thing in the world - although the result was better than expected - but that with another result in the European Parliament elections his election could have been prevented. I was among the supporters of Anyone but Barroso! and I stand to this opinion, because I am still convinced that his lack of charisma and his inability to stand against the negative forces of the member states were amongst the reasons that made that the European Union did not advance much over the last 5 years. But now I can only wish luck and strength to Mr. Barroso, who has been proposed by 27 democratically elected governments and approved by an absolute majority of directly elected European parliamentarians, and is thus one of the most democratically legitimised political figures in the world. After he got elected today, Barroso said that he wants to work more closely with the European Parliament to make the Union a "European parliamentary democracy". If this is his firm intention, he deserves every support from us - even from those running against him until now - and if he really wants this help from our side he will get it for sure. But we will hold him responsible for these words over every minute of his term - hopeful that after five more years we might be able to say that second five years of the Barrosocracy were far better than the first. On the same topic: E.g. Publius, Coulisses de Bruxelles, Gulf Stream Blues, Cecilia Malmström, euenvironmentblog, La Oreja de Europa, Silvana Koch-Mehrin, The Lobby, FT Brussels Blog, Cédric Puisney, Marie Ramot, Francesco Molica, Brussels Blogger, EU Referendum, European Union Law, Global Europe, ResEuropa, Charlemagne, Eva en Europa, Glennis Willmott, Grahnlaw, Public Affairs 2.0, Hökmark, Europe Sociale, Petra Sorge, Europabloggen, Eurocrat, eurosocialist, El mundo desencajado, L'Europe en Blogs, Géopolitique, Jochen Bittner. Two days ago, three new Commissioners have been approved by the European Parliament, but the Commission saw no reason to announce this on its main website. Since until now there is still no remark regarding this change on the Commission website, it'll probably never happen. So the Commission will continue to be the faceless Commission, filled with unknown personalities shaping the lives of 500 million people. It will remain so, because if new faces and names are not properly communicated, they won't be noticed, recognised and most probably also not taken seriously. I regard this a massive failure of the institution - and the only question I ask myself is whether this is a deliberative decision or just pure ignorance. Both cases would be fatal. PS. : And if I may add a sentence of sarcasm: Thank you, MEPs, that you will re-elect the person responsible for all this today! I just came across this lovely site with the Commission's staff statistics (via Dan Luca). Only 2 out of 37 (5.4%) top administrative ranks (category AD16) in the European Commission are filled with females, and with 49 out of 235 (20.9%) for AD15 or 66 out of 431 (15.3%) for AD14 - these three ranks cover directors and directors-general - the next two ranks do not look very gender-balanced either. I suppose somebody has some beautiful statistics how much better the situation has become over the last years, and I know that these upper ranks are filled with life-time officials which makes it hard to push for a rapid change, but what about credibility when it comes to the fight for gender equality, e.g. with regard to the new anti-discrimination directive, if the Commission cannot serve as a positive example? And where are the Swedish Presidency and the European Parliament who should push the Commission on these issues? As you can see from the links set above, the respective websites of the Commissioners have already been updated to the new Commissioners, although they have been formally approved only today. If, by accident, I had come on the Commission website today, it would have seemed as if nothing has changed over there. No single information about the news that the legal approval by the European Parliament took place today, not to speak about the voting results that you can read in the European Parliament press release. This is yet another example of the inability of the European Commission to contribute to a democratic image of the Union: Yes, today a democratically elected supranational parliament has approved (including dissenting votes) parts of the EU's political executive - but this executive does in no way communicate this democratic event. Does anyone care? Or am I the only one concerned? 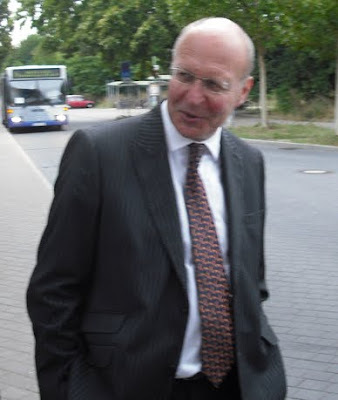 Quick snapshot of Andrew Duff, MEP and President of the Union of European Federalists, after he spoke on the European Parliament Elections 2009 at the final roundtable of the 5th ECPR General Conference in Potsdam/Germany. In a fascinating blog post, Steve from the European Parliament web editors shares the feelings of what might be the pre-web 2.0 generation, those already acquainted with the internet in all its forms, but still hesitant to get heavily involved in what is now called "Web 2.0". "The pressure is always to be cutting edge, to be doing the latest thing, surfing the latest trend. We need to do that, but we cannot do only that. If our notion of digital democracy is to focus ALL our efforts on Facebook and Twitter (or whatever’s next), we win plaudits from the in-crowd online, but we arguably open up a digital divide of our own, cutting off an otherwise completely sentient crowd of people (I know many of them) who may have heard of Facebook and Twitter, but still think it’s a bit of a waste of time. They exist, yes, they use the internet, and they vote…"
As a standalone paragraph it sounds a little flat, but it fits into the whole article. It fits because it raises the important question whether doing more democracy 2.0 is actually involving more people, or if it is just raising the applause from the "in-crowd" (which many of us in the blogosphere are definitely belonging to), making it sound like reaching a larger share of people, without actually doing so. I am a little too tired today to further elaborate on the topic, but I'll definitely take it into account when writing my next post on EU politics 2.0 at the Personal Democracy Forum Europe. I will come to Brussels. This may not sound revolutionary for someone writing a blog that has become focused on the European Union. But it will be the first time in two years and thus the first time during the life of this blog that I set foot into the bubble. I am also a complete Brussels outsider, my last visits being connected to pre-scheduled short-term events with limited amounts of time to really discover the political scene of the city. So I'll probably arrive in the evening of the 30th of September and stay for a week. And in this week I'd like to meet with as many people as possible, starting from breakfast and ending with the last glass in the evening. I want to discuss EU politics, life in Brussels, and maybe possible projects that one can set up to get closer to an EU democracy 2.0. I'll still contact some of you (as soon as I know that the date is definite), readers and commentators of this blog, whom I want to meet, but if you're already interested in meeting you can also email me and I can then try to get my schedule right. BEWARE: Bashing the blundering Barroso because of his blatant behaviour is bogus, yet biased backtalk builds up the brilliant and bright but bruised brains of those baffled backbenchers broadly betoken "bloggers"! As you can see from the opening alliteration, this "Europe in blogs - Euroblogs" is something special, dedicated to a marvellous mind who - as I have reported - is begging on 40+ pages to get re-elected by the European Parliament. In a more reflected note, Renaldas sees the presentation of the Barroso programme as an important precedent in the history of the European Parliament, showing the increased confidence of the Parliament. In a less reflected note, Gawain shares his visualised thoughts on the content of Barroso's presentation. For Rafael, Barroso is suffering from what he calls the Napoleon syndrom, searching for eternal power, while for MEP James Elles the 40 pages document is written from a worm's perspective. But looking at this Napoleonic worm in the EU Zoo, it seems like the economic proposals coming from Barroso are nothing but old wine in new bottles - yet, if the old wine is the only wine, then it is still the best wine as MEP Katrin Saks concludes. However, using old wine to get re-elected in September will make the manoeuvre difficult (but not impossible), says Durarte, while The Croydonian feels that the style of Barroso's prose leaves a great deal to be desired, maybe because he drinks too much. In a more sober style, Stefano writes an open letter to Swedish Prime Minister Reinfeldt asking not to re-elect Barroso, but the Swedish minister for European affairs answers with "NO! ", because she thinks that Barroso's programme is long but easy to agree on. Now I was thinking about how to link from prose and style to content, but thankfully Finnegan counted Barroso's buzzwords, and Mathew presented them in a more stylish way, so that I don't have to invent a bridge on my own. What we learn from what both guys did: You need computer programs to understand Barroso. This opinion is definitely shared by the people at Google where they also count words to find that Barroso has no idea about innovation. And Jean would have probably been very happy if innovation was the only blind spot of Barroso, not accompanied by 100 other failures that he lists in the latest post of his series "Campaign Journalism in the 21st Century". When it comes to content, Judith is convinced that Barroso is too vague on climate issues. But why care about content, if one finds, like Conor, that there is not much content at all? And before finishing: If you want a more eloquent "Europe in blogs" on the Barroso story - especially one in a much more beautiful language - I recommend the latest "L'Europe en blogs" where you will learn that Jesus returns! That's it for now; "Europe in blogs - Euroblogs" will return soon with an objective and unbiased look at Europe and the European blogosphere. PS. : I would have liked to link much more blog posts, but nobody cares about Barroso out there. This is all I found - if you found more, tell me! You have never heard about CIREFI, the Centre for Information, Discussion and Exchange on the Crossing of Frontiers and Immigration? Apparently, it is a forum of national experts meeting every two months to exchange information on legal and illegal immigration. The Centre was created in 1994 and includes all 27 member states plus Norway, Switzerland, Iceland, and Liechtenstein. Okay, you might say, so what? Interestingly, all member states have been asked what they think about this Centre, and for once the answers to the questionnaire sent out by the Council secretariat are fully public (pdf), which allows a comparative assessment between 30 states (Liechtenstein didn't answer) on a set of 18 questions. And although CIREFI is just one of the many groups within the immense field of working groups, expert committees etc. that govern the European administrative space, the comparative reading of all answers still gives some very useful insights. Considering the activities of other platforms dealing with the issue of illegal migration, do you consider there still to be good reasons for the existence of CIREFI and that it continues to be useful for the participating institutions? (a) If so, what do you consider to be the main benefit of CIREFI? (b) If not, what are your suggestions for the future functioning of CIREFI? and it seems like all member states consider the body a valuable forum for the quick exchange of information on migration, in particular illegal migration, and for the personal contact between professional working in the respective field(s). Some (like Finland, Germany) point to the fact that there is the possibility to double work with Frontex or that the work of these bodies could be combined, but most answers still indicate that they see an added value in this particular body. "On the contrary of some other EU bodies working parties with the Council guarantees equal treatment of all Member States." So if you are interest in European migration policy, trying to understand EU and Schengen politics in this regard, the questionnaire gives a pretty good insight into one rather unknown institution facilitating the flow of information between the member states, thus probably having a significant impact on the political and technical perception of the problem throughout the EU and beyond. In any case, it good to see such an assessment in a public document, and I would be glad if this was the case for many other documents, too! I have been asked by responsibles at the Personal Democracy Forum, and in particular from the Personal Democracy Forum Europe subsection whether I would like to blog on their platform on issues related to European politics and modern technologies. Since I knew that Bente was already writing there, I thought it would be a good idea to join in the effort of reaching out to new audiences, those not already involved or even interested in EU politics. "EU politics 2.0: Getting the citizen into European democracy"
It is a fairly general and simplified introduction into the topic I am going to cover in future, but I think I managed to accentuate the most important challenges we are facing with regard to EU politics and communication strategies. For the next post(s) I will try to involve you and your ideas, helping to spread the message and to foster creative thinking on how we can create European debates through online and offline activities - I count on your creativity! I suppose this is a topic on which so much has been written and so much could be written that a blog post is the least appropriate thing to write. Yet, if you ask me how it is being a German 70 years after the beginning of World War II, I can only say that the concept of war is so unreal, so unthinkable for me due to the way I have been raised as a German citizen and thanks to the way in which I have become a European that I can only be grateful to be a German born into this generation. We do not celebrate any military victory of ours, we have no stories of war heroes, no great minds and fighters, brave and strong in the face of the enemy. What we have are murderers and cowards, simple people drawn into the army, and young boys forced to fight for nothing at the end of the war. We have destruction and death, disgust and disgrace. For me as a German, war is nothing but evil - and I am glad it is this way, because there is no single reason or anecdote in our socialisation that makes us like war, weapons, or the killing of others. When the war started 70 years ago, my grandparents were young children or not even born. When my parents were born, over a decade had past since the end of this most murderous of all wars. When I was born, several decades had past since this 1st of September 1939 in which the myth of the nation, the ideal of the gun, the predominance of horror started to dig their own grave into which millions and millions of human beings were pulled before it was finalised. 70 years later, being German for me doesn't mean to feel guilty for the past, it means to feel responsible for the future. If my ancestors and their friends and families were ready to go into such a war and to execute the atrocities of the Holocaust, then it could be that people like me would do it again, unless we use this pain deeply fixed into our minds to prevent this from ever happening again - not just here, not just in Europe, but anywhere where people invest most of their time, and money, and effort, and human lives to kill others for the sake of a horrible higher good, be it the nation, the race, or the religion. 70 years later, we as Germans cannot make the past undone, but we can use our collective memory to tell our story, a story in which we win by losing, in which we are happy not to be the winners, feeling ashamed for what has been done in "our" name in the past. 70 years later, I am European because I was raised as a post-war German in a Europeanised and re-unified Germany, and I live in the hope that anyone coming after me will still be post-war and never pre-war again.